Hommage to a Good Trip? The symbol, dubbed the Candelabra of the Andes, can be seen from 12 miles off the coast. 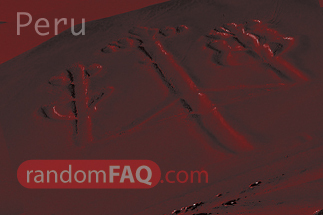 Today those who populate the Pacific near Peru still use the symbol as a guide. I personally agree with the assumption that the image depicts the datura plant. It is theorized that the indigenous peoples of Peru could have traveled as far as the present day United States to obtain datura. Datura is a naturally occurring hallucinogen. This drug is also used in Haitian zombification... as part of an antidote. Something as powerful as this over 2000 years ago must have seemed like magic. Some say it is a giant cactus and even fewer say that it is an ancient seismograph able to detect earthquakes all over the world.